< Click here to get directions from where you are. 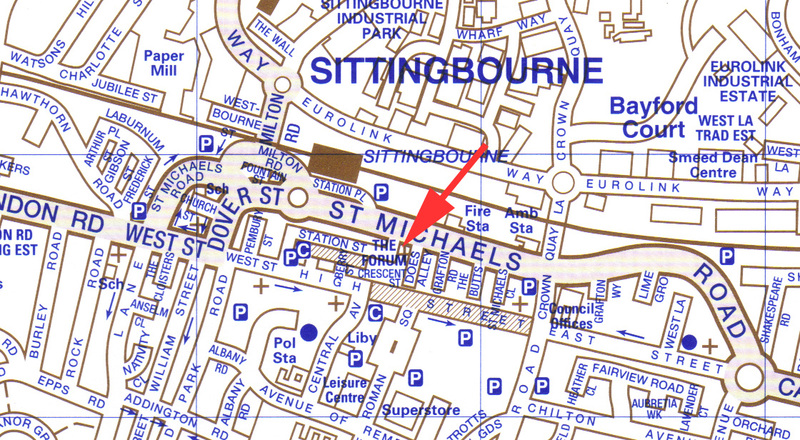 Sittingbourne is on the A2 approx. 40 miles from London. It can be approached via the M2 or M20 motorways, or from London mainline stations with 2 trains an hour on most days. Leave the M20 at exit 7 or the M2 at exit 5, from both motorways head northbound on the A249 Sittingbourne/ Sheerness bound, exit at the interchange with the A2 at Sittingbourne. Proceed along the A2 eastbound for about 1 1/2 miles you then turn left into the one-way system follow St Michaels Road (and road sign for Faversham) at the railway station roundabout take 2nd exit proceed along St Michaels Road past the railway station, the rear entrance to the church is 2/10ths of a mile from the roundabout. There is a car park at the Forum Shopping Centre on your immediate right or an alternative public car park opposite the rear entrance to the church just past the Kwik-Fit tyre centre on the left. Once parked in either of these car parks you will find Does Alley next to the St John's Ambulance HQ on the south side of St Michaels Road almost opposite St Michaels Car Sales. Proceed down Does Alley you will find the entrance to the church half way down on the right, there is no on-site parking. Full Google Map facilities coming soon.